Powers/Abilities: Dr. Calvin is a knowledgeable and experienced biochemist. (Astonishing Tales#16 (fb)) - Dr. Calvin and her son Percy attended the funeral of her husband, Henry, and Percy encouraged her that they would make it. (Astonishing Tales#16 (fb)) - Dr. Calvin told Percy to study hard; even though her lab experiments kept her away from him so much, she still wished to be proud of him...for him to be free, brave, and strong. (Astonishing Tales#16 (fb) - BTS) - Percy sought power as a street criminal, eventually working under the criminal Pusher under the nickname Vinnie. (Astonishing Tales#12 (fb) - BTS) - Dr. Wilma Calvin was coordinator at Project: Gladiator, working alongside Dr. Paul Allen, Dr. Barbara Morse, Dr. Ted Sallis, Dr. Wendell, and her assistant Jim, in a project to create a super-soldier, an indestructible warrior. (Astonishing Tales#12 (fb) - BTS) - SHIELD warned Project: Gladiator about AIM. 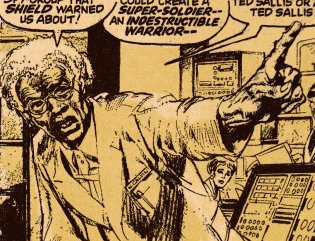 (Astonishing Tales#12 (fb)) - Dr. Calvin wandered the swamps, searching fruitlessly for the missing Ted Sallis. She was observed by the Man-Thing and pursued by a superstitious local (Jasper Petrie) who wanted to punish her for "her evil ways" and creating monsters. The Man-Thing stopped the pursuer, allowing Dr. Calvin to reach the Project: Gladiator laboratory, but she soon found that a mob of superstitious locals had captured Barbara, who had also been out searching for Sallis, and had gathered outside the lab to put a stop to her work. Dr. Calvin approached the mob, telling them they were just doing research, but the stories of Petrie, who had just had his arm amputated by doctors, had driven the mob into a frenzy. They threatened to kill Barbara unless Calvin halted her work, but Barbara revealed that the ringleader of the group was actually an AIM agent, sent to stir up the locals. The security at Project: Gladiator then showed up, and the ringleader continued to threaten Barbara, but then the Man-Thing showed up and pummeled the mob into submission. Still retaining some small fragment of Sallis' intellect, the Man-Thing tried in vain to communicate with her, and she sensed something familiar in the creature. She suspected the connection between the newly appearing creature and the recently missing Sallis, but as she approached him, one of the locals fired his shotgun straight into her back. Agonized both by the resulting emotional outburst and at the potential loss of the only one who could help him, the Man-Thing fled. (Astonishing Tales#12 (fb) - BTS) - For several weeks, Dr. Calvin was treated at the laboratory where she remained in a virtually comatose state, emerging only long enough to murmur "Ted Sallis" or "Man-Thing." (Astonishing Tales#12) - Barbara returned to the laboratory with her new ally, Ka-Zar, and was disappointed by that Dr. Calvin had not improved. They were then distracted by the commotion as another group of AIM agents captured the Man-Thing. (Astonishing Tales#13) - Dr. Calvin remained in her semi-comatose state while Ka-Zar & Zabu encountered the Man-Thing and battled agents of AIM. With no sign of Sallis, Barbara, as next in command, ordered Project: Gladiator to be relocated to SHIELD's New York base. (Astonishing Tales#13 - BTS) - As they made preparations, however, SHIELD agent Paul Allen, secretly a double agent for AIM, shot Dr. Wendell and abducted Dr. Calvin. (Astonishing Tales#13) - Ka-Zar and Zabu coerced the still-captive AIM agent who had shot Dr. Calvin to tell them where AIM would have taken her. Ka-Zar, Zabu, and Robert fought their way into the AIM base, but then Paul revealed himself to be part of AIM and took Barbara hostage. The Man-Thing then broke into the base and slew Allen and directed Ka-Zar, Zabu, and Barbara to flee with Dr. Calvin while he detonated the base's self-destruct mechanism. (Astonishing Tales#15 (fb) - BTS) - Ka-Zar, Zabu, and Barbara took Dr. Calvin to Manhattan, and she was recovering rapidly. (Astonishing Tales#16 (fb) - BTS) - An unidentified solo AIM agent offered the Pusher a large sum of money for Dr. Calvin. (Astonishing Tales#15) - As Ka-Zar, Barbara, and Zabu approached Dr. Calvin's apartment, they found Vinnie and a group of other agents of the Pusher abducting her. Ka-Zar and Zabu overpowered the criminals, but Dr. Calvin's body was stressed by the shock of the conflict, and Barbara rushed her to a hospital, where Dr. Wallace stabilized her. (Astonishing Tales#15 - BTS) - Dr. Calvin, fading in and out of consciousness, asked for her son, Percy (aka Vinnie, whom Ka-Zar had just dropped off to the police). (Astonishing Tales#16 (fb) - BTS) - Dr. Calvin remained in intensive care, so unstable that a sudden shock might put her over the edge. She kept muttering for her son, Percy. (Astonishing Tales#16) - After Vinnie was released from jail since there had been no witnesses, the Pusher pressured Vinnie to help him capture his mother. Ultimately, however, Vinnie aided Ka-Zar against the Pusher, who used his strength-augmenting exoskeleton to badly injure him. Ka-Zar rushed Percy to the hospital, and he was placed in the same room as Dr. Calvin. Upon rousing slightly, Dr. Calvin was shocked to see him so bandaged and casted, but Ka-Zar assured her that Percy was a hero and that he would live -- and so must she. Accepting this, she decided to ask further questions later after she was better rested. (Astonishing Tales#20 (fb) - BTS) - Dr. Calvin recovered and went back on the job. (Astonishing Tales#19 - BTS) - Victorius (empowered by another Super-Solider serum variant), allied with the Plunderer and Gemini, kidnapped Barbara Morse to learn SHIELD's progress in re-creating the Super-Soldier serum. Fury sent Ka-Zar to rescue her, and he gave Ka-Zar their Super-Soldier serum to take with him in case he needed it to rescue Morse. As he approached the kidnappers' castle base, Ka-Zar decided he was better off using his own abilities and foolishly tossed the Super Soldier serum-containing vial into a field. (Astonishing Tales#20 (fb) - BTS) - AIM agents recovered the vial. (Astonishing Tales#20) - Freed by Ka-Zar, Barbara recovered the vial from the AIM agents and reported this to Fury. Aboard the SHIELD Helicarrier, Dr. Calvin was pleased to hear Barbara's report, but she asked if Ka-Zar was still OK, and Fury instructed her to "tuck that vial away in some safe unmentionable, leave your transmitter on, and git your tail in there and bring 'im out!" When Barbara came upon the scene where Victorius prepared to battle Ka-Zar, Barbara tossed him the vial so he could fight Victorius on equal terms, but he denounced it as unnatural and threw it into the fire , then defeated Victorius on his own. With the only existing serum sample destroyed and herself being the only one alive who knew the formula, Dr. Calvin decided that she agreed with Ka-Zar and refused Fury's orders to make a new sample. (Ka-Zar: Lord of the Hidden Jungle#4) - After the Man-God (Maa-Gor), who held Ka-Zar and Barbara prisoner in the Savage Land, made an extortion threat to SHIELD, Fury told Dr. Calvin that this was exactly why she had to come up with a new sample of the Super-Soldier serum. Dr. Calvin explained that she saw the serum as a double-edged sword that could be used against them, and that Barbara would have to handle things without the serum. (Mockingbird: S.H.I.E.L.D. 50th Anniversary#1 (fb) - BTS) - Fury had Dr. Calvin's SHIELD funding cut and as a result she lost her position at Georgia Tech. 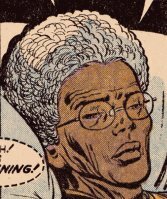 Even years later her son Percy, who had become a Reed Richards Award winning researcher himself, disagreed with her past decisions because in his opinion her work should have been shared with the scientific community. When Percy learned Barbara Morse aka. Mockingbird, who his mother had been a mentor to, was injected with a cocktail of the Super-Soldier Serum and Infinity Formula he killed his own mother to lure Barbara to him so he can examine her. Even though Wilma saw her son coming at her she didn't raise her arms to protect herself. She died of a blunt force trauma to the back of her skull. (Mockingbird: S.H.I.E.L.D. 50th Anniversary#1) - Barbara met with Percy at the morgue where his mother's corpse was kept to examine it along with her son. Percy handed Barbara a bone saw to do an autopsy on his mother. During the autopsy Percy talked about his mother and her past mistakes before changing topic to Barbara's survival due to a mix of the Super-Soldier Serum and Infinity Formula. (Mockingbird: S.H.I.E.L.D. 50th Anniversary#1 - BTS) - After the autopsy Barbara told Percy that she knew who had killed his mother and pulled her gun on him, but Percy had laced her latex gloves with a neurotoxin, which rendered her unconscious. When Barbara came to she quickly freed herself and overpowered Percy again. She then called the police to arrest him for the murder of Wilma Calvin. Barbara attended Wilma's funeral. Wilma was lauded at the funeral as a longtime civil rights activist, champion of science, feminist and a dedicated single parent and patriot. Comments: Created by Len Wein and Neal Adams. The Wein/Adams section of 'Astonishing Tales' #12 was pretty clearly intended for the second issue of 'Savage Tales' magazine, which would have come out around the middle of 1971 (depending on whether the mag was supposed to be monthly or quarterly). However, for whatever reason, 'Savage Tales' #2 didn't come out, so the material was later used to pad 'Astonishing Tales' #12 (June 1972) and to reintroduce the Man-Thing. 'Savage Tales' did eventually resume publication, with #2 cover-dated October 1973. So Roy & Big John may have "introduced" her, but Len & Neal had obviously already "created" her for their (up to that point) unpublished story. Good idea, keeping Dr. Calvin in a regular apartment where anyone could break in and get to her. Profile by Snood. Mockingbird update by Markus Raymond.